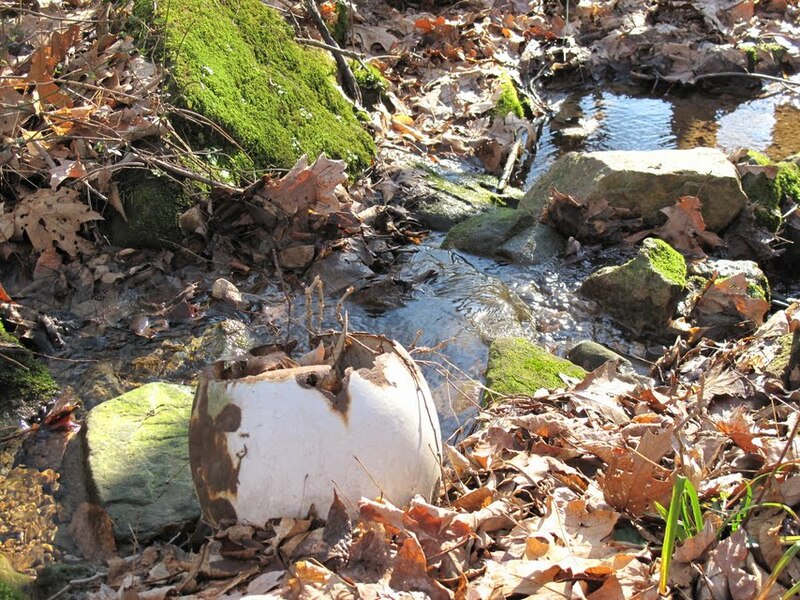 Enameled steel pot in a small brook. I wonder whether the rusting was helped with a few rounds of buckshot. Normally, any kind of litter in a stream annoys me. But there’s something about antiquities like this that have a certain charm. It was once common practice for farmers and country folk to dump trash into ravines. Some still do. I remember helping friends clean out a dump behind their farmhouse in Central Ohio. It was a great social occasion, sort of like a barn raising. Only dirtier. Plus, it was kind of interesting unveiling a rusted, tattered mosaic of the lives of people who once lived there. Read Any Good Shop Manuals Lately? A few days back, Timothy Gorka of the Book Loft Literati mentioned on facebook that he’d received a copy of “Shop Class as Soulcraft” for Christmas. Given my blue-collar background, the title caught my attention. I did a quick online search to see what it was about. The author, Matthew B. Crawford, is an academic who runs a motorcycle repair shop in Virginia. The book, which is subtitled “An Inquiry Into the Value of Work,” is about how America undervalues blue-collar workers. It reminds me of one of my old Cleveland friends, Andy Kessler. Andy is college-educated. Unlike a lot of us, he actually has a degree. But he decided to go into auto mechanics. For those of us who drove marginally road-worthy vehicles, Andy was a savior. (All right, my ’53 Chevy with no floorboards and the gas tank in the trunk was marginally marginal.) He had a talent for inexpensive fixes. I once saw him use a torch to neutralize the rust in a taillight bulb socket. Andy had an apartment on Hessler Street that served as party central. We were a loose-knit group with more creativity than sense. A lot of times, our tribal gatherings escalated into theme parties. Cardboard parties were popular for awhile. You could bring anything you wanted, as long as it was made out of corrugated cardboard. Probably the most outrageous contribution was an operating car chassis with a body made entirely of cardboard boxes. I went to one Halloween party dressed as Andy — complete with long black hair, a full beard and garage duds with a patch on the pocket with Andy’s name on it. A lot of people went along with the gag and I spent most the night fielding automotive questions. If nothing else, I learned that MDs aren’t the only ones who get pinned down at parties by people trolling for free professional advice. Afterward I came up with an idea for another theme party — a “come-as-you-aren’t” party. The idea was that everyone would come dressed as someone else among the regulars who hung out at Andy’s apartment or frequented his parties. But, over the years, we all went our separate ways and it never got past the “big talk in a little bar” stage. Too bad. It would have been a real eye-opener to see yourself as your friend’s see you. Maybe too much of an eye-opener.